We have seen a significant amount of pre-launch coverage of Qualcomm-powered Always Connected PCs, also known as Snapdragon PCs, and previously known as Cellular PCs. This initiative has been public knowledge for well over a year. Now Intel has shown its cards with which it hopes to fend off any usurper such as Qualcomm. 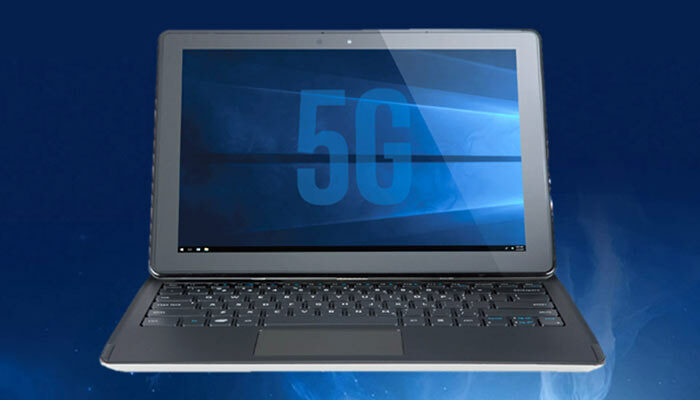 In an official News Byte yesterday Intel announced that it is collaborating with Dell, HP, Lenovo and Microsoft to bring 5G connectivity to Windows PCs. Intel expects the first high-performing 5G-connected PCs, using the Intel XMM 8000 series 5G modem, to be on sale in the second half of 2019. As usual with many of these 5G announcements, Intel paints a picture of a super-fast-data nirvana - "imagine immersing in untethered VR from anywhere in the world, or downloading a 250 megabyte file in seconds from a parking lot". It will herald very fast data communications but also deliver new experiences, asserts Intel. We don't have much more info about Intel's 5G PCs as yet. One important question will be if they can match or beat Qualcomm's boast of (4G) machines coming with a battery life of 30 hours or more. However, they are very likely to be faster at running traditional Windows programs. Qualcomm is already lining up the Snapdragon 845 (still 4G) for a big boost in performance compared to the yet-to-ship Snapdragon PCs. More information about the 5G PCs will be shared by Intel (and perhaps by its partners) at MWC next week. In particular Intel will share a sneak peak at a concept 5G-connected PC – a detachable 2 in 1 – connected by an early 5G modem and powered by an 8th Generation Intel Core i5 processor. Yay, Intel want us to adopt built-in 5G connectivity… what are the odds that presumably it can't be deactivated at a base level, you know, so those built-in security flaws “accidently” left by Intel can be fully exploited without annoying security software getting in the way monitoring and blocking ports and the like. Too cynical? Moi? Well, as much as I enjoy seeing people stir the pot, it's hard to suggest that adding 5G is primarily something Intel wants to do to provide backdoors. Nobody builds houses just to provide a service spying on bathrooms. After ME and Spectre and Meltdown and every other recent revelation have gone public, there may yet be the faintest chance that they will implement it properly. 5G… considering I can't even get 4G where I live, and 3G isn't exactly great either, it makes absolutely no difference to me lol. It's been a while since I read anything about 5G, is it to completely surpass 4G for general mobile comms or is it more targetted at shorter ranges? I recall hearing that it would “revolutionise home networks” but can't recall why. Last time I checked it was supposed to be something that could basically replace a land line internet connection AND be able to be used with mobiles…although as far as I know the UK hasn't even auctioned the spectrum or that the full standardised specs haven't even been agreed on.